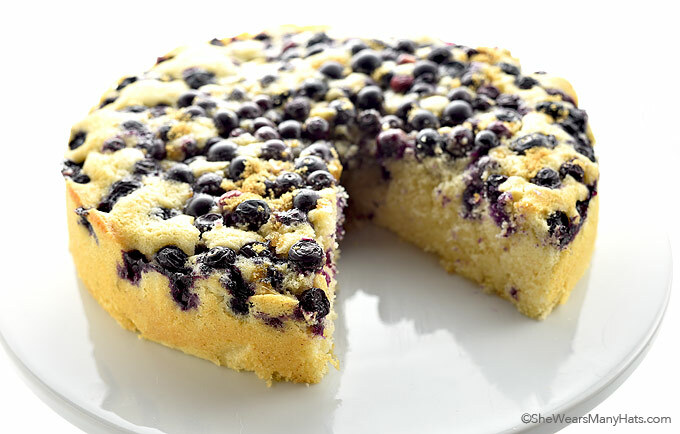 With a hint of lemon and fresh blueberries, this easy Lemon Blueberry Buttermilk Cake recipe is a delicious dessert for any time of the year. Baking with fresh berries is a treat and always results in delightful desserts. Whether it’s strawberries, blueberries, blackberries, or any sweet berry, I don’t discriminate. I like them all. And when added to cakes, pies or cobblers, fresh berries really do marvelous things. 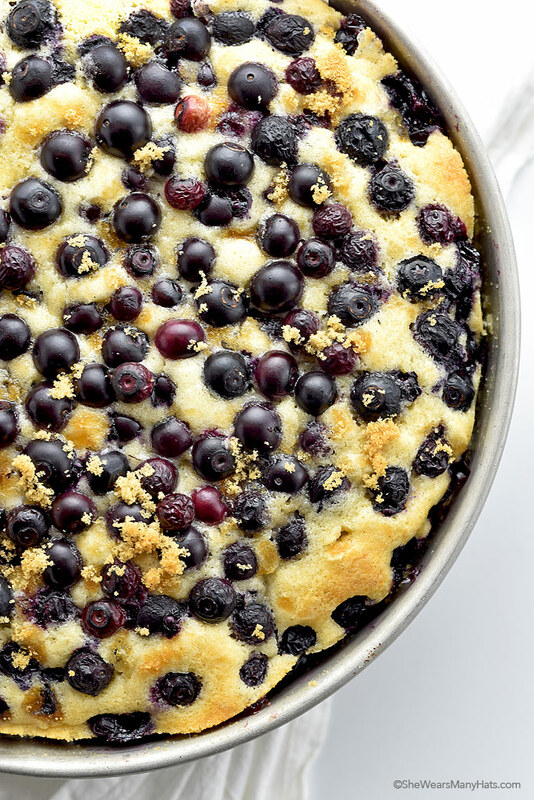 This Lemon Blueberry Buttermilk Cake is no exception. 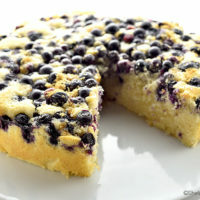 Fresh blueberries top this light and lemony Lemon Blueberry Buttermilk Cake that is so very easy to make. A bit of basic cake mixing is all that is required, then spread the fresh blueberries on top and sprinkle with a smidgen of brown sugar for a slight added crunch and that is it! 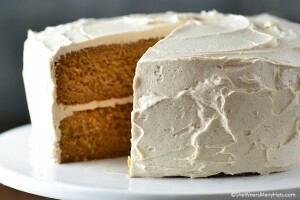 This cake is so simple, yet oh so delicious. It’s a cake perfect for any gathering and would shine at a baby or bridal shower or afternoon tea. I’ve baked this cake recipe in both an iron skillet and a 9-inch round. While I do prefer baking this cake in an iron skillet, as it lends a more crispy edge similar to a muffin (I do like crispy edges), 9-inch round cake pans are so easy to work with. And if you do have multiple 9-inch round cake pans, it is very simple to make a couple of cakes at one time if feeding a larger group. 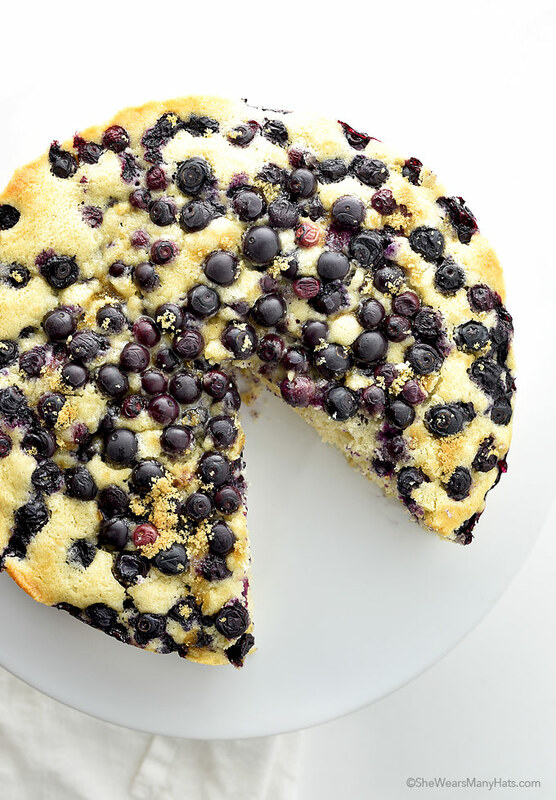 I’ve served this Lemon Blueberry Buttermilk Cake straight out of the pan, but if you do want to transfer it to a cake stand or platter, make sure to let it cool completely. Serve this delicious Lemon Blueberry Buttermilk Cake topped with fresh whipped cream or vanilla ice cream, and even more fresh blueberries for a delightful dessert for any occasion throughout the year. This easy light lemony cake topped with fresh blueberries is nice for serving with fresh whipped cream or vanilla ice cream. Preheat oven to 325-degrees F. Grease and flour a 9-inch round 2-inches tall cake pan or a 9-inch oven-proof skillet with deep sides. Beat softened butter, granulated sugar, lemon zest and cinnamon on medium for 4 minutes, until smooth. Beat in eggs and vanilla extract, beat for 1 minute on medium, stopping at least once to scrape down bowl. In a separate bowl, whisk together flour, baking powder and salt. Alternate gradually adding flour mixture and buttermilk to batter mixture. Mix until just combined. Pour batter into greased pan. Spread batter evenly. Top with blueberries. Sprinkle brown sugar evenly on top. Bake at 325-degrees F until tooth pick or cake tester comes out clean, about 50-55 minutes. Let cool in pan for 10 minutes before transferring to a cake plate or serve straight from pan. The perfect brunch food for out of town summer guests! Thank you Amy! Love buttermilk cakes! And I’m loving how many juicy blueberries are in here. It’s absolutely gorgeous! Blueberry and lemon is one of my favorite combinations. This looks so good! One of the best combos ever! Add buttermilk and I know this must be delicious! Yes! Buttermilk makes magic happen. It really is a delicious cake, Jessica! I love a crispy cake crust that flour doesn’t give so I spray my cake pans with Pam then put about 1/2 cup of granulated sugar in the pan, tap it around then dump the excess. This is great for decorator cake pans with a lot of detail!! I tried doing your thing with the sugar and my cake didn’t rise 🙁 I don’t know if that’s why (I didn’t mix too much and my baking powder is fresh). Still look good, but we’ll see tonight! I just so happen to have a carton of buttermilk that needs to be used up! This cake is so darn gorgeous and I’m sure it will be a huge hit. I made this tonight as part of breakfast for dinner. This was incredibly good. So happy to hear that you enjoyed this cake, Tory. And yay, breakfast for dinner! 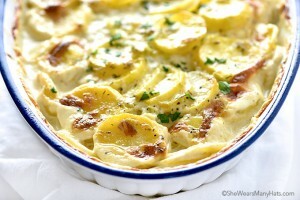 Can I use a 9x13x2″ casserole dish instead of a round pan? I’m only asking because I don’t have a round cake pan or an oven proof skillet but I do have the casserole dish. Yes, but with a 9×13 the cake will be thinner and cook times will have to be adjusted accordingly. Easy to make and delicious. Looks pretty, too. Can it be frozen? I have not tried freezing this cake yet. Made this the other night for my kids and partner (I’m not a sweets fan). They really really loved it! I tasted the batter before pouring it into the pan and I felt that it needed another tablespoon of lemon rind and an extra teaspoon of vanilla. Baked a lot quicker than the recipe calls for, but that could be my oven. It was delicious (even for this non-sweets person!) and my kids and partner loved it. 80% of the blueberries sunk to the bottom, but it wasn’t really a problem, just made it a little messier to serve up. If you’re a lemon-lover, maybe add more rind. Even after it baked and was sampled, I felt like it could have used triple the amount of rind called for to give it a true 50/50 lemon/blueberry taste. Very very moist, truly delicious. We splurged and served warm with chunks of salted butter on top. HEAVENLY! Oh my, chunks of butter on top! That sounds fabulous!